this is a <strong>tag</strong> and my script. There are a lot of ways the <script> tag can hide inside the HTML, escaping (pun intended) even the most sophisticated text sanitizers. The source in the script tag can now do anything it wants - like grab the sensitive data and send somewhere, or make API calls on the user's behalf. It is pretty severe compromise at this point. You can see a very strict and solid CSP header if you curl https://github.com website. It is a beast, and I had split the relevant header across multiple lines to clarity. I also trimmed long lists of domains in some lines. You can find this code snippet in this collection. Content Security Policy directive: "script-src assets-cdn.github.com". or a nonce (&apos;nonce-...&apos;) is required to enable inline execution. 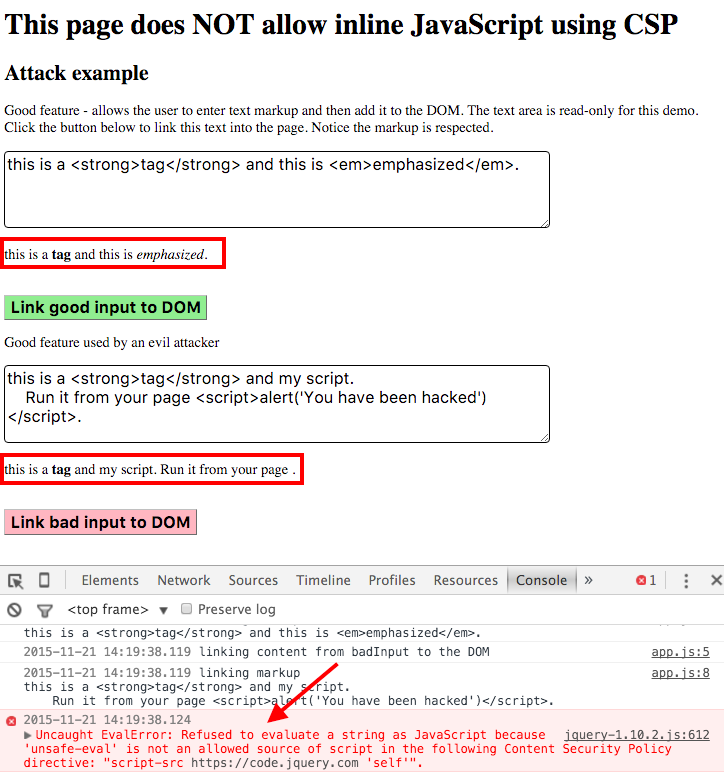 the inline script execution flag script-src unsafe-inline is not present int the CSP header. the page also allows specific white-listed scripts via SHA list, but our script obviously is not on this list. Now do the same on cnn.com, and it runs just fine. 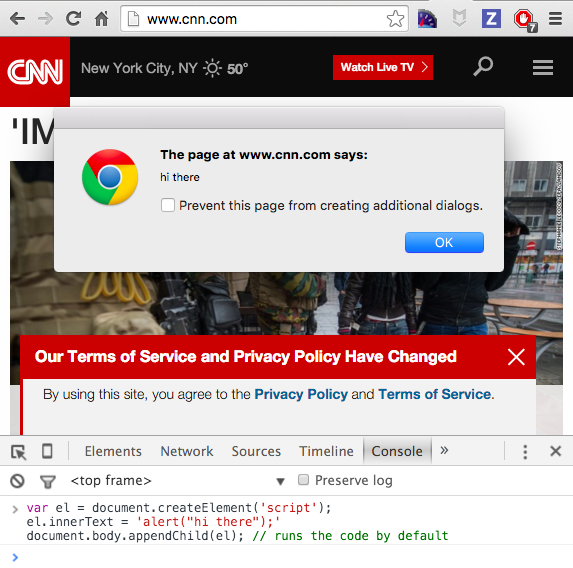 So if there is user supplied content (like visitor comments), and it is not validated very well, it could potentially be linked directly into the DOM, executing the user supplied source, as if was valid code written by the CNN page developers. For simplicity, we are going to set the security policy on our demo page using the meta attribute instead of the recommended way (response header 'Content-Security-Policy'). This way we can still use the static web page without running a demo server. You can try the page yourself here. As a partial bonus, if you have a global error handler, like Sentry, Raygun, or your own, you can catch an error notification (but without any details, at least in Chrome 46) when a script tries to run but is prevented. There are two levels of 'Content-Security-Policy' standards. Then one I have shown here, if used via a response header is widely supported. Most of the modern browsers (IE10+) support setting the list of allowed script sources link. There is a newer list of features (Content Security Policy Level 2) that allows white listing inlined source scripts by SHA, but it is only supported in a very few browsers, so I recommend against it. Vue.js framework also has a CSP-compatible build that does not use inline JS or styles. My personal website is using Vue.js with HTML fragments injected right into the DOM, CSP-compatible vue.js build allows to do this safely. What happens if the attacker replaces an external script? If an attacker can replace an external script served from your domain, or change a script served by a CDN then you have a big big problem. 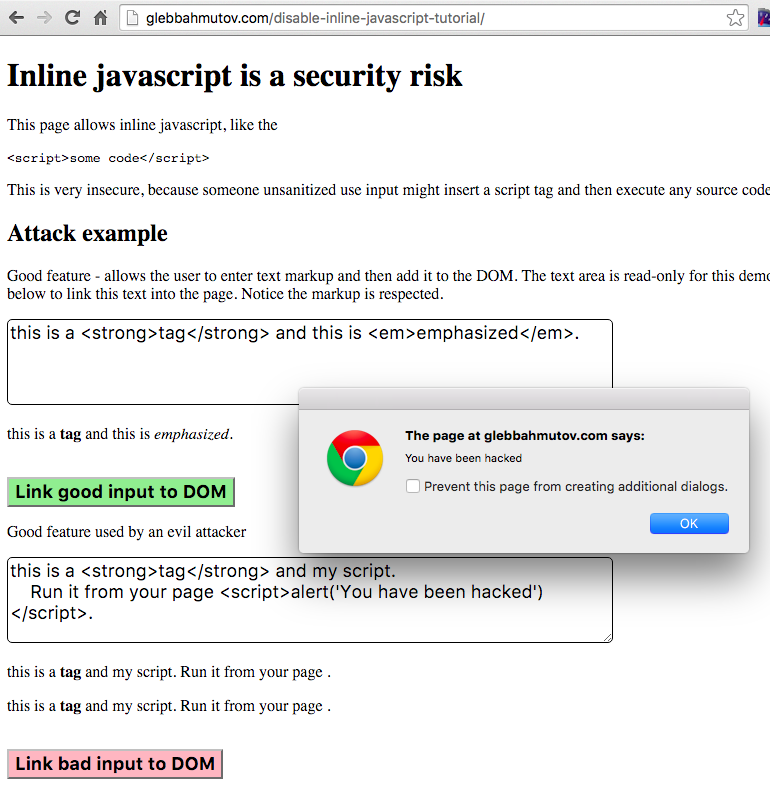 Your website is serving malware at this point and any client-side protection is useless. Secure your servers, download every external script via HTTPS. Can an attacker change the meta Content-Security-Policy tag, by injecting a new one for example? Yes, this is why you should include your own tag at the very top of the HEAD tag, or better send the same info using response headers. Can I verify that an external script is the one I receive? Use HTTPS and Subresource Integrity (SRI) where you specify SHA for the resource that you expect to receive. If CDN sends something different, the browser will refuse to run it. I just need an exception for a particular inline script, can I make an exception? There is the second level of content security specification (CSP2), which is not yet supported by most browsers. In CSP2 you can specify SHA for each allowed inline script. Other inline scripts will not execute be executed, since the SHAs will not be in the white list. Can you lock down allowed domains more precisely? Yes, instead of specifying just a domain like https://ajax.googleapis.com to serve <script src='https://ajax.googleapis.com/ajax/libs/angularjs/1.3.14/angular.min.js'></script> you can allow https://ajax.googleapis.com/ajax/libs/angularjs/1.3.14/ for example. Don't forget the trailing slash! You can even allow a specific file, like srcipt-src: https://ajax.googleapis.com/ajax/libs/angularjs/1.3.14/angular.min.js to lock everything down.